When you hear “smart thermostat” the first names that comes to mind is either Nest or Ecobee. Nest enjoyed an unrivaled market leadership in smart thermostats for a long period as they were the pioneers. After a few years, Ecobee came with a couple of outstanding smart thermostat models to take share from Nest. Now Emerson has released a really good smart thermostat model – ST75 under its “sensi” series of thermostats. Emerson is a very reputed company manufacturing automation products for years and has a legacy of 128 years in business. Let’s go deep to know more about Emerson Sensi – ST75 – Smart Thermostat. The key highlight about Emerson Sensi ST75 is that it offers all essential features of a smart thermostat on a budget price. 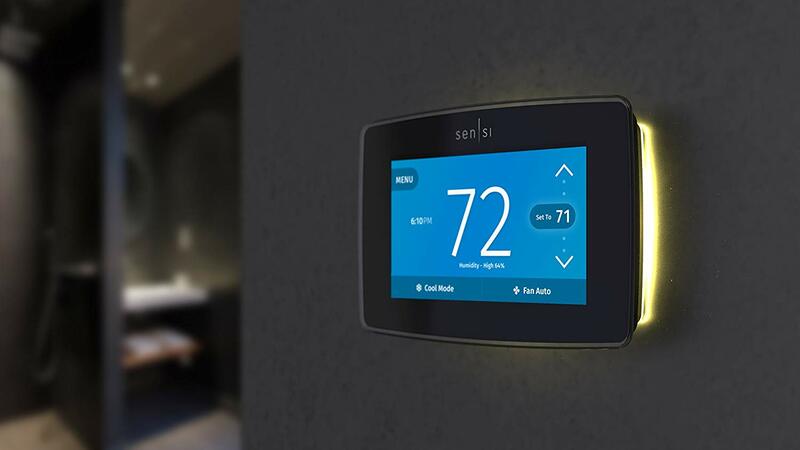 Sensi ST75 offers all major features of a smart thermostat like #energy savings – where energy & money is saved by running the hvac system at max efficiency, #geo-fencing – where the location of homeowners are tracked and rooms are preheated when the homeowner nears home from office or far away places, #voice control enabled and works with Amazon Alexa, Apple HomeKit and Google Assistant. Apart from this 7 day scheduling and smartphone app based control (using WiFi and internet) are provided just as good as Nest & Ecobee. The main drawback is lack of “self learning” unlike a Nest or Ecobee model. You’ve to program the thermostat yourself based on your preferences (Nest & Ecobee are self learning and they program themselves automatically). Another key point is size of thermostat and display – which is definitely bigger & bulky than Nest & Ecobee (which are sleek and round). But bigger display has its own advantages (easy to setup and program) and some homeowners really prefer thermostats with bigger display. The key fact to check before buying any thermostat is compatibility with your home HVAC system. You should be informed that some thermostats do not support certain HVAC system types. Let’s see the compatibility guide for Emerson Sensi ST75 thermostat. C-Wire Requirement – “C Wire” or common wire is required for this thermostat. If your home wiring doesn’t have c-wire, Sensi ST75 can not be used in your home. Note: Sensi has a compatibility checker tool in their website. Please make use of it and check compatibility. Energy Savings – is the key highlight feature of Sensi ST75, just like Nest and Ecobee. Though Nest and Ecobee declared their energy savings to be 13% and 23% respectively, Sensi has not made any official number based claims. We can assume it to less than Nest (13%) for the time being. Geofencing – is a smart feature in Nest and Ecobee. Now Sensi also adds the same! Geofencing is nothing but tracking a homeowner using his mobile phone and adjusting the home temperature after he leaves and before he arrives. Flexible Scheduling – Set the program using the thermostat touch screen or using the mobile app. 7 day programmable and set a unique schedule for each day that fits your lifestyle. Sensi ST75 is a budget friendly, value for money thermostat that suits any homeowner. Two key points against this models is lack of “self learning” and the inability to interface extra room sensors. Both Nest and Ecobee can be interfaced with extra room sensors to mange any cold spots in your home. Apart from that, Sensi ST75 is a great choice.